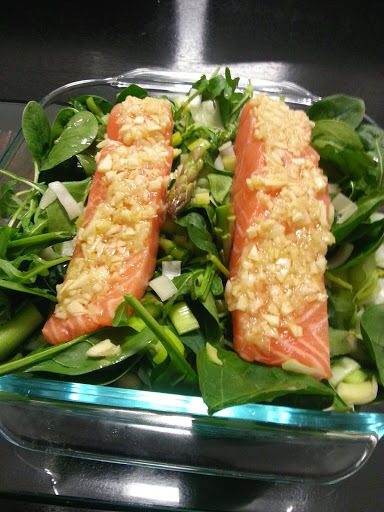 Salmon and vegetables ready to bake – feel the health! This is a simple recipe which I have adapted from one by Gillian McKeith that I found years ago during a no preservative, no dairy, no red meat, low carb period of my life. I’ve always loved it and have added to and changed it to suit my tastes. Once you have made it a couple of times it is incredibly simple and quick. I recommend making this about once a month to help you to feel healthy and fabulous. Plus it is delicious. Baked salmon always feels special. Every ingredient in this meal is brimming with nutritious goodness. The combination makes for a yummy meal which will leave you feeling satisfied without a trace of guilt. You will have some leftover spring onions, so it is good to plan another recipes using up the leftover spring onions in the same week, eg a stir fry. 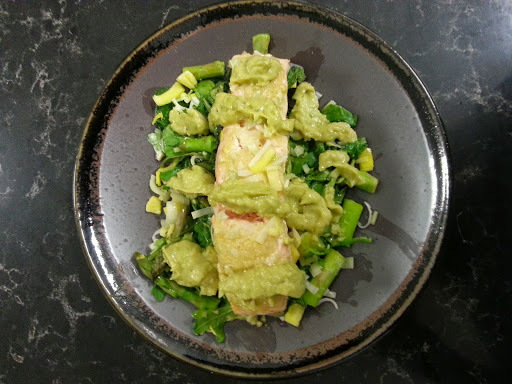 Replace the avocado sauce with guacomole, leave off the sauce completely, or replace it with another sauce that you like on salmon, such as soy sauce, for something completely different. Marinade the salmon steaks in soy sauce then roll in sesame seeds instead of coating in the ginger, garlic and olive oil mix. Serve on a bed of couscous if you didn’t just carb out on the weekend like we did 😉 Experiment with other vegetables. Nuke the leek in the microwave in a small amount of water for 2 mins, drain. This wont cook them all the way through but will ensure that there are no crunchy bits when it is done. Fill a small casserole dish with vegetable goodness. 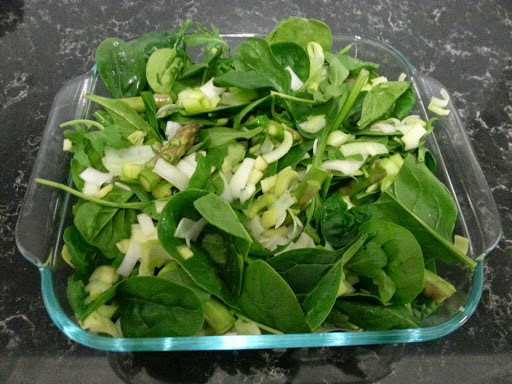 Green green white green – you won’t believe how much this will reduce with baking. Bake in the oven for 20 minutes, or until the salmon is cooked to your liking. I’d recommend checking it after 15 mins as ovens vary and some are picky about the done-ness of their salmon. I actually like mine medium-well done (I know it is wrong but it tastes so right to me). 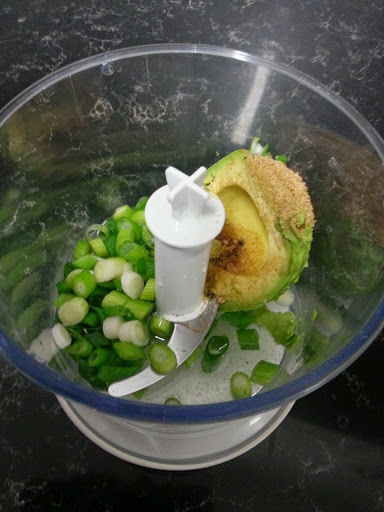 Meanwhile, put avocado, water, coriander seed, salt and pepper (if needed) into a food processor, blitz until smooth. This will be nice but not a strong flavour, so don’t be tempted to over salt it unless you are a salt fiend – in which case go nuts. 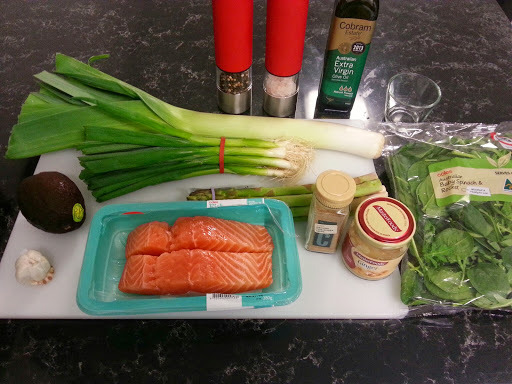 I find that the lemon juice, salmon, garlic and ginger in the meal itself provide the punch. A soft flavoured sauce is what this meal needs for balance. Squeeze lemon juice over everything, then serve avocado sauce over or beside salmon and veggies. Enjoy! Brimming with health. Delicious to boot!